Come and join us for one of our fun-packed conferences which offer a full day of CPD and networking for music teachers and practitioners. 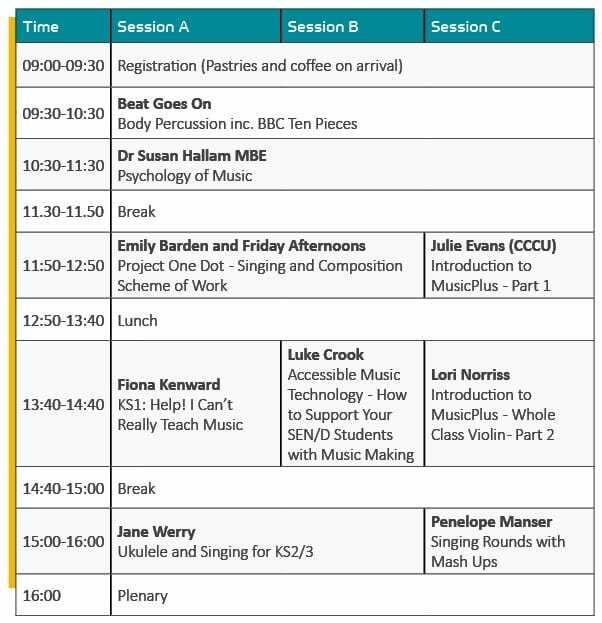 Sessions will include: Body Percussion and BBC Ten Pieces III, Psychology of Music with Dr. Susan Hallam MBE, Change up your Singing, Introduction to MusicPlus, KS1-Help! I Can’t Really Teach Music!, Assisstive Music Technology, Ukulele and Singing with Jane Werry and much more. Lunch, parking and resources included. There will also be a session to question and share knowledge and approaches with each other.